Please welcome Borsch, the most well-know beetroot soup in Russia. 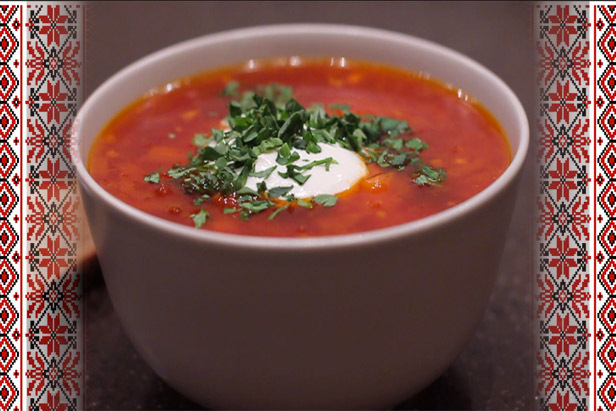 Borsch is an immortal classic, a symbol, and the face of Russian cuisine. Real borsch takes a while to prepare. But it's worth it. Watch the video and unveil Russian cookery secrets! Borsch is a variety of soup based on beet, and a traditional dish. It is very popular among many nations of Eastern and Central Europe. For instance, it is part of the national cuisine of Ukraine, Russia, Poland, Belarus, Romania, Moldavia, and Lithuania. Borsch is supposed to be one of the best national vodka side-dishes. 2. A mandatory ingredient of Ukrainian borsch is, of course, salo (lard), while the Russian recipe does without. 3. The Russian recipe contains half the amount of cabbage, but more carrots, which in Ukrainian borsch can either be left out (only the vague term "vegetable root" is mentioned) or added whole and then removed. 4. Russian borsch contains no added flour.